The following article appeared on Shippensburg University's Alumni website (www.ship.edu/alumni). It was reprinted with permission from Stephanie Swanger, Office Assistant for the Shippensburg Alumni Relations Office. 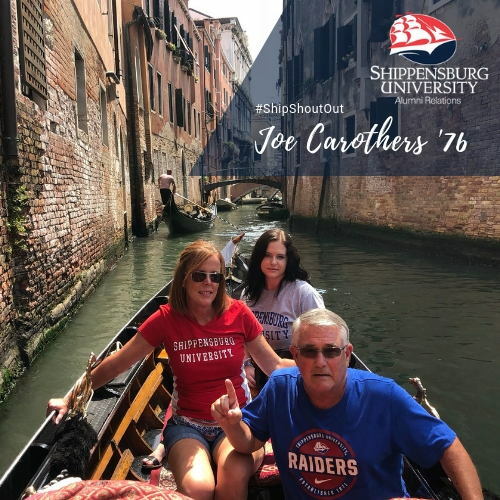 The article highlights Joe Carothers (Zeta Omicron/Shippensburg 1976). Joe Carothers is a 1976 communication/journalism alumnus and is the director of sales and marketing at Checon PMC. He has spent 38 years in industrial sales and management in the OEM electrical industry. Joe serves on the Alumni Association Board of Directors and is an active member of Theta Chi fraternity, organizing the Theta Chi tailgate at Homecoming annually. Joe is instrumental in the Pittsburgh area, actively spreading his Ship pride to high school students and families. This fall, he coordinated and co-sponsored the Ship in Pitt tailgate at Highmark Stadium which connected over 100 alumni and friends, including the Red Raider Marching Band. When Joe isn’t promoting Ship, he is earning his title as “The Codfather” of fish fries in western PA! Joe has run a wildly successful Lenten fish fry fundraiser for Our Lady of Miraculous Medal Church for the last nine years. Sales have maxed out at nearly $140K and the event has been featured on WPXI TV, KDKA and Froggy radio, PG, Trib and Observer Reporter newspapers. Joe is married to Susan Carothers and lives in Washington, PA. He attended Ship as a proud first-generation student, and now ushers his daughter, Kate, into the Ship family as a legacy. Kate is a member of Alpha Omicron Pi sorority and will graduate this May with a BS in Psychology and a minor in Biology. Thank you, Joe, for all that you do for the Alumni Association, Ship, and your community. Today we celebrate you! Happy National Joe Day! Joe is pictured in Venice with his wife, Susan Carothers, and his daughter, Kate ’19.